In February 2013, I opened an online shop on Etsy.com. After much hesitation, self-doubt and lame excuse finding, I finally dove into the Etsian world. For those who are not familiar with Etsy, it's a gigantic and fascinating website where you can find all kinds of fabulous objects, stories and people. The main point of Etsy (and why I chose this platform, on the enlightening advice of my friend Gowoon, whom I thank and salute!) 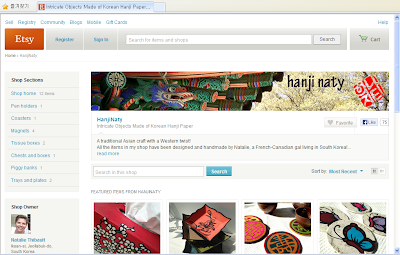 is to offer handmade items. To be sold on Etsy, an item has to be made by hand. There is also a vintage section (where you can find some amazing things, by the way! ), as well as a craft supply section. One of the interesting aspects of Etsy is the possibility to literally build your own shop. Each shop owner has the means to personalize his or her boutique, with their own banner, an "about" page that allows you to introduce themselves with pictures, customized policies, etc. For the banner of my site I chose a picture of the gorgeous rooftop of a Korean Buddhist temple. The colors and designs are just stunning to me, and it remains an inspiration for me when I choose my designs, colors and patterns. To show you how long it took me to find the courage to open that shop, I actually created my Etsy account (with the intent of opening a Hanji shop) in April 2012....! It's almost a full year later that I finally decided to press the "Publish" button. The first item I sold on Etsy! The opening of my shop started with a bang, as my first item was sold in less than five minutes! It's actually a dear friend of mine who bought my very first set of handmade Hanji magnets. I was so thrilled! I remember the rush I felt when I saw the pop-up window saying "Cha-Ching! Congrats Natalie! You've made your first sale - You're in business!" During the first months of my Etsian adventure I was more or less isolated. I was spending time creating Hanji items, but at a very slow pace, and I was struggling with self-doubt and with this awful feeling that I was lost in a sea of beautiful things and that no buyer would come and rescue me. 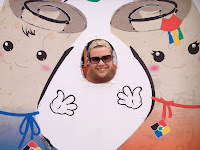 Then I visited the two major Hanji festivals in South Korea : The Jeonju Culture Hanji Festival in May 2013 and the Wonju Hanji Festival in September 2013. Those two visits were literally eye-opening for me! I had a chance to meet fellow Hanji artists and to get inspired by unusual and fabulous paper! It also gave me the desire to get more involved myself, maybe by taking part in a Hanji contest or even having a small booth at next year's festival! After my visit to the Wonju festival in September, I decided to be proactive on the Etsy site. I realized that I couldn't stay alone in my workshop, hoping that traffic and business would magically come to my shop. I had to get involved and stop being so scared! A Treasury features up to 16 items. First, I started by joining a few promotion teams. I began to participate in promotion games, and I made my very first treasury on September 2 (to this day I have made about 60!). 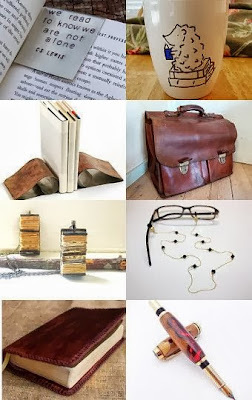 A treasury is a collection that any Etsy member put together. The items can be chosen by theme, color, price range, material, etc. 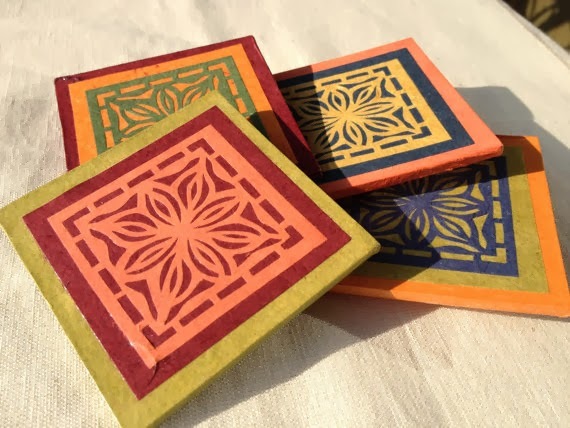 Treasuries are a great way to draw attention to your items, and to connect with fellow artists and artisans on Etsy.... and they're a lot of fun, too! I started to take part in promotional games and cross-promotion actions and I quickly noticed that the number views and favorites in my shop was madly increasing! I also get more and more followers on my personal feed on Etsy, which is very encouraging and motivating! Let's hope that these new connections will bring me concrete business in the near future. About a month ago I received an invitation to join the "Strategic Promotion for Success" team. I was already a member of about two dozens teams, but I decided to accept the invitation anyway, just to see what SPST had to offer. Oh my! Joining this team is one of the best decisions I have taken since I opened my Etsy shop! After a few days only I started corresponding with the Captain of the Team, a lovely and very driven artisan named Anna. She asked me if I'd be interested in writing an article about Hanji paper on the Team Blog. I was thrilled! One thing leading to another I am now a member of the Leadership Team for SPST! It is very rewarding and exciting, and it has given me great occasions to discover new tools, make new friends and, most importantly, it has really motivated me to do more, create more, get more engaged and involved in the Etsy world! FB, SOTD, BNR, SEO.... OMG! The more I became involved in the world of Etsy shops and teams, the more I discovered that those creative people speak another language! I won't lie, I had to look up quite a few acronyms and expressions that I just couldn't understand! To deepen your linguistic knowledge, visit techdictionary for more Internet jargon and abbreviations! Very interesting!